Look out! The Hatter with the mad killing skills returns in his third graphic novel, Hatter M, Volume Three: The Nature of Wonder . Once again, Sami Makkonen brings the adventure to life with his stunning artistic abilities while Frank Beddor and Liz Cavalier craft the story leading Hatter M on his quest to find the lost Princess Alyss and return her to Wonderland. If haven't had the chance to take in either of the previous two volumes then you are truly missing out on some very nice graphic novels, but I think this third volume is the best one yet. It begins in an insane asylum with people who all believe they are from Wonderland. Some play dressup, pretending to be Alyss and her bodygard, while the doc tries to talk sense into these folks. And one guy even makes a bold attempt to return to his lost world by plunging himself through a full-length mirror, though all his journey nets him is seven years bad luck. Next we find ourselves in 1865, at the end of the American Civil War. A mad Confederate general somehow gets his grubby paws on a bunch of apothecary vials filled with a dark potion capable of transforming men into ferocious animalistic monsters. The only man who could possibly stand victorious against such invincible foes is still on his quest to find Alyss, seeking out the glow of powerful imagination that she illuminates. But she's not the only one with a strong imagination, with the glow. While on his way to meet with fellow hat lover President Abraham Lincoln, Hatter spies another such being sporting the glow, and follows the mystery man to what turns out to be a laboratory. The man is Agent Horatio Alabaster, a scientist driven to find a counter agent for the effects of the dark potion so that the evil Confederate General and his men might be stopped before they tear the wounded country apart. But time is not on the side of White Imagination as the General's forces are already on the move toward the White House. Regardless of the outcome, Hatter Madigan's adventures are far from over, and many more interesting characters await in the second half of this exciting graphic novel, but I don't want to give it all away! I will say that one of my favorite scenes in the book is a lengthy flashback where we get to witness a young and inexperienced Hatter Madigan when he was still just a cadet, boldly attempting to follow in his older brother's respected footsteps. And after the story concludes, we're treated to a five-page preview of the next volume, The Zen of Wonder, followed by some beautiful-full page artwork, and finally some journal entries written by Princess Alyss herself. Fans of the first two volumes will definitely want to pick this one up, and those that don't have the first two volumes will want to go out and get them. Doing so is made even easier since a brand new hardcover edition of the first Hatter M book was just released, so no more complaining that it has been out of print! The new release features a couple extra chapters, which are good but hardly make it worth buying a second copy if you already own the original. 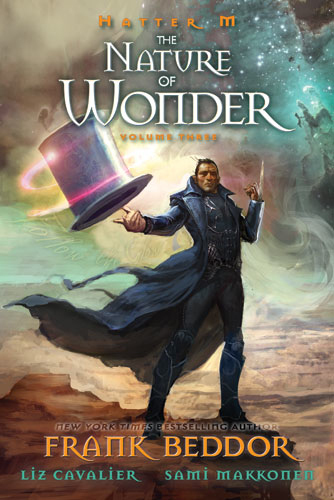 Hatter M, Volume Three: The Nature of Wonder is published by Automatic Pictures and was released on November 23, 2010.